This is a story about ignorance. This is a story about fear. This is a story about stupidity. This is a story about intolerance and even hate. And above all, this is a story about injustice. This is a story about all of those terrible things because this is a story about a simple Irish Catholic washerwoman named Ann Goodwife “Goody” Glover who was wrongly put on trial and executed in Boston, Massachusetts Bay Colony in 1688 for being a witch. This is a story about how prejudice, fear, and stupidity can result in paranoid fanaticism and mindless killing. The story is a warning to us all of the inherent dangers of ignorance and bigotry. In this case the bigotry was directed against an innocent woman who happened to be Irish Catholic. The term “Goodwife” was a word used in those days to mean a woman of moderate social status such as a housekeeper or nanny who took care of children. "Goody" was a shorter version of that term. Ann is referred to in both ways in research material. We are not sure, also, if Ann’s last name was really Glover since indentured servants and slaves, like Ann, were often called by their master’s last name then. Ann and her husband were unfortunate enough to be among the Irish Catholics selected by Cromwell’s military to be sent by force to Barbados, never to see their relatives and friends and Ireland again. Ann’s husband was reportedly killed when he refused to abandon his Catholic beliefs. But little is known about Ann’s life while she was in the Barbados. What is known is that she and her daughter eventually arrived in Boston in the 1680s where Ann become a Goodwife or house servant who also minded children. Ann worked for John Goodwin; and among her other duties, she cleaned the laundry. The story becomes muddled at this point. One version is that Ann became ill one day, and the children likewise became ill. The other version is that Goodwin’s children accused Ann (probably falsely) of stealing laundry which caused Ann to argue with the children who in turn became upset and ill. Whatever the case, the children fell sick and began to act in odd ways. A doctor was called who could not determine any cause or cure for the illness, whereupon the doctor -- in his learned wisdom -- concluded the problem must be the result of witchcraft. Everyone blamed Ann, accused her of being a witch; and she was arrested. Having lived in Gaelic speaking Ireland in her youth, naturally Ann spoke primarily Irish Gaelic. She apparently knew some English, but Irish Gaelic was her main language. She could understand many English words, but she had great difficulty in speaking English words. So, being nervous and upset after being accused of such a horrible crime as witchcraft, she did most of her talking in Irish Gaelic. The legal authorities, confused by what she said to them, concluded that the alien language she spoke was the language of Satan. 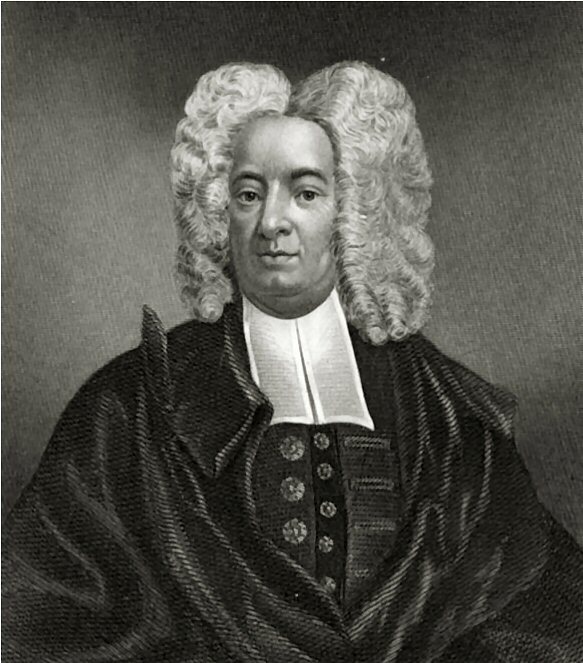 A trial was held and presided over by a famous (or infamous) “religious” leader of the day named Reverend Cotton Mather, a graduate of Harvard and ostensibly a learned scholar, but nevertheless an incredibly bigoted and ignorant man -- despite his so-called education. Mather wanted to hear Ann recite the Lord’s Prayer. It was believed that a witch could not properly speak the holy words of the Lord’s Prayer, being possessed by the Devil. Cotton Mather eventually realized that she spoke almost exclusively Irish Gaelic, and sensibly a translator was summoned. This appeared to help procedural legal matters until Mather directly ordered Ann to say the Lord’s Prayer. Ann recited the prayer, but she spoke it in a mixture of Irish Gaelic, her native tongue, and broken Latin, which she no doubt learned from her Catholic faith. The Reverend Cotton Mather, the Harvard graduate, then concluded that she must be guilty because she was incapable of speaking the Lord’s Prayer properly in the King's English or even in proper Latin as all good people certainly could. Seeking further evidence, the legal authorities searched Ann’s house and found what the court concluded were small dolls or figurines. Most likely these were homemade statues of Catholic saints. The Court concluded the dolls were “idols” and works of the Devil used for sorcery. In addition to this “evidence” the Court also believed witnesses who testified that they saw “spectral evidence” against Ann. This idiotic form of evidence was testimony from a “witness” who claimed to have seen or even dreamt that the accused appeared to the witness as a spirit or a witch’s “familiar” such as a black cat. Incredibly, the court accepted this nonsense as persuasive evidence. On top of this Cotton Mather somehow came to believe that Ann had engaged in sexual relations with the Devil. How he concluded such an absurdity is, of course, beyond any rational explanation. 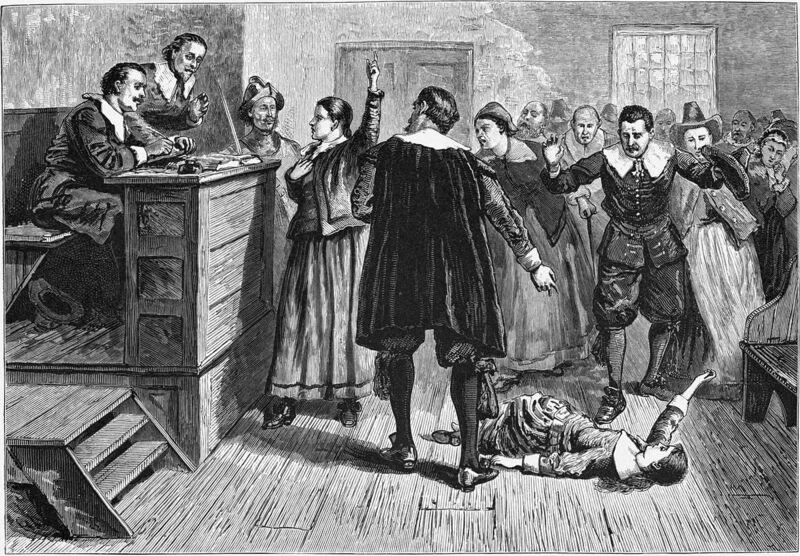 All of these matters show the extreme insanity of witch hunts and witch trials in those terrible days. But the trial of Ann Goody Glover shows us something else even more deplorable. It reveals the blatant prejudice that existed at that time based on ethnicity (being Irish) and religion (being Catholic). This was different from the clownish though deadly circus of the typical witch trial; this was a deliberate persecution and injustice committed against an innocent defendant because that person was Irish and Catholic. Being Irish and Catholic in Puritanical Boston was literally enough to get you killed. Now armed with what the court felt was sufficient evidence of witchcraft, it was decided that Ann Glover must die. Ann Goody Glover was hanged to death on November 16, 1688. A crowd appeared at her hanging which was probably composed mainly of Puritans as that was the majority population of the time. 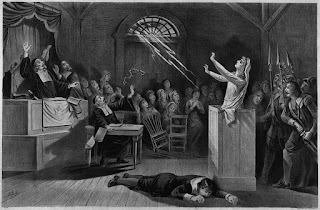 Some denounced her as a witch and “Papist,” and at least one person observed that Ann’s cat was nearby, which some believed was further evidence of the Devil and witchcraft. Cats were seen as the Devil’s familiar or spirit. The hanging of Ann was, of course, simply murder. The “trial” was a circus and a farce. It would have been comical had it not been so horrendous in its result. The trial and execution of Ann shows us the disgraceful state of education, medicine, organized religion, law, and society of that day. Ann died because she was Irish, Catholic, and -- lest we forget -- a woman, since the vast majority of innocent victims of witch hunts in those days were women, although some men and even children were also falsely accused. 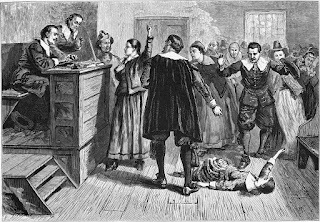 Cotton Mather went on to be heavily involved in the equally atrocious Salem Witch Trials in 1692, probably the most infamous of all the witch trials in early America. These trials were directly influenced by the cruel and farcical trial of Ann Glover. There are some people today who consider Ann to be a Catholic martyr who died for her faith. And there is strong evidence -- real evidence -- to support this claim. She never renounced her Catholicism despite great pressure to do so. To its credit, the modern-day city of Boston in 1988, 300 years after Ann’s execution, made November 16 Goody Glover Day in her honor -- recognizing her innocence and the injustice done to her based on prejudice. We can never undo the horrible injustice done to Ann, but by telling her story we can honor her memory and perhaps try to build a world were prejudice and fanaticism are abolished and justice prevails. Note: This article is dedicated to the late Professor Frederick Swaim of the Loyola University School of Law in New Orleans who taught me law ... and other things. He was my teacher, brother-in-law, and friend. How did "Goodwife" happen to become part of her name? Was that common in those times? That's a good question. The term "Goodwife" was actually a title used in those days for a woman of modest status. So, for example, a housekeeper and laundress like Ann was was called a Goodwife. "Goody" was simply a short version of Goodwife. Today Ann is usually referred to as "Goody" Glover, and there is even a Goody Glover day, as I understand it, in Boston. The day honors her memory and the injustice done to her. I would have to think that the large number of Irish Americans in Boston had an influence on politics in Boston to recognize this Irish Catholic victim of prejudice and a witch hunt. But that is just my guess.